In the 1990s, following the breakup of the Soviet Union, hundreds of thousands of Jewish families from the former USSR emigrated to Israel, Germany, and N. America. Singer Sveta Kundish's family was part of this great wave of movement, relocating from Ukraine to Israel in 1995. Years later her parents discovered a set of reel-to-reel recordings, made by her grandfather Motik Bezman in the 1970s and '80s, which had survived for the past 40 years, and which chronicle the day to day life, songs, and stories of her family in the shtetl Ovrutsch, Ukraine – part of a Jewish life there that has all but disappeared. Using these recordings as inspiration, Kundish and accordionist Patrick Farrell collaborate to tell the story of one Ukrainian Jewish family, from Kundish's Great-Grandfather - a cantor in the synagogue in Ovrutsch - through her present life in Germany as a performer and cantor herself. Woven around the story are songs in Yiddish, Hebrew, Russian, Ukrainian, and Italian, either performed live by this acclaimed duo or brought back from the past through these rediscovered recordings. 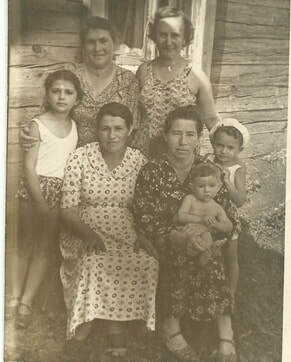 Family photos from the past 100 years, projected onto a screen next to the performers, give the audience a window into typical Jewish life in Ukraine during the years of the USSR, and into the widespread experience of emigration in the years after.